Hardee's Thickburger, at 1,320 calories and 95 fat grams, is "not a burger for tree huggers"
(CNN) -- In the midst of first lady Michelle Obama's campaign against child obesity and chef Jamie Oliver's prime-time TV initiative for cleaner cooking, a chicken chain is crowing about some aggressively fat-laden fare. 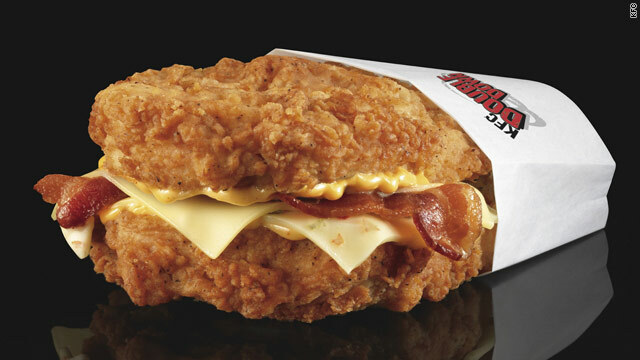 KFC's long-rumored Double Down waddles into stores on April 12, boasting an ingredient list that prompted a copywriters' caveat on the product's Web page that it is "Real! No fooling." Response from around the Internet ranges from Consumerist.com's "mysteriously tempting (and potentially lethal)" and the Huffington Post's "going too far" to the Lincoln Journal Star's "fast-food-related crimes against humanity," but KFC's gamble on the Double Down's outré appeal to calorie scoffers seems downright chicken in light of a new baseball concession pitched by the Toledo Mud Hens. At a March 24 press conference, V/Gladieux Enterprises, the catering company that services Fifth Third Field announced a sundae, "Which is fifteen scoops of Toft's ice cream served in a full size souvenir helmet for $25. It will serve 1 to 8 fans, you can enjoy by yourselves if you love ice cream or share with family and friends." Food court city: How does where you live affect what you eat? A solo at-bat with the Fifth Third Fanatic Freeze would average 2,325 calories, based on a ½-cup scoop size -- before a grand slam addition of whipped cream, hot fudge, rainbow sprinkles, peanuts, and cherries. Dessert not on the roster? That same full-sized batting helmet can switch-hit as a bowl for cheese-drenched Fifth Third Nachos -- a perfect snack after you've finished running the bases the approximately 341 times it would take a 150-pound person to burn off the aforementioned ice cream. The Mud Hens and KFC's Colonel are hardly the first food vendors to flip a big ol' bird at the calorie cops. Here are a few that have flown outrageously afoul over the past few years. The King didn't just come slinging a brand new portmanteau of "meat" and "enormous" with this limited-time item. Starting in 2005, the now-discontinued breakfast bomb came loaded with two eggs, one sausage patty, two slices of ham, three slices of bacon and two slices of American cheese on a long, toasted bun. That's 770 calories, 47 fat grams and a near guarantee of waking up in a cold sweat from a food coma nightmare starring that creepy, plastic-masked King. A salad sounds pretty sensible, right? Depends on what you mean by "salad." A cheeky 2009 commercial for the chain's crispy tortilla-swaddled heaps of rice, beans, cheese, meat and additional tortilla strips defined the dish as "technically a salad" due to the presence of some lettuce shreds buried under the other ingredients. The Bell's 54 fat-grammed Chicken Ranch Taco Salad is the second most caloric item on the menu, weighing in at 910, but comes served, improbably, with reduced fat sour cream. Baseball's Best Burger In 2006, Sauget IL's Frontier League baseball team, the Gateway Grizzlies paired up with Krispy Kreme Donuts to pay homage to the Luther Burger, popularized at Atlanta's Mulligan's restaurant. The multi-meal mash-up consists of a thick, bacon-and-cheese-topped burger patty, stuffed inside a sliced, glazed donut. It's estimated to weigh in around 1,000 calories with 45 grams of fat. It was declared by professional face-stuffer Adam Richman of Travel Channel's Man v. Food to be "deliciously psychotic." Hardee's CEO Andrew Pudzer told CNBC upon the Thickburger's 2004 debut that the 1,320-calorie, 95-fat-gram sandwich was "not a burger for tree huggers." After downing two 1/3-pound beef patties, four strips of bacon and three slices of American cheese stacked on a mayonnaise-slathered bun, it seems unlikely that many eaters would be able to summon the strength to walk outside to a wooded area -- let along sling their arms around it. The chain also offers a bun-free, lettuce-wrapped 1/3-pound Low Carb Thickburger, should one of those wacky health nuts insist upon coming along for lunch.